If you are being a good bunny parent and cleaning your rabbit’s litter boxes at least every two days (every day for rabbits over 5 lbs. ), then you realize that one of the biggest daily expenses of keeping an indoor pet rabbit is the absorbent material that you put into their boxes to soak up their urine. Whether you use CareFresh® or wood pellets, throwing out a litter box full of the stuff adds up and can easily cost $20-40 a month per litter box. Having several rabbits or litter boxes can multiply the expense and I will share with you how my wife, Denise has learned to save about 75 percent of our CareFresh bill on the four litter boxes that we clean each day. It will cost you less than $20 to get enough material to work for four or five litter boxes and you will save enough CareFresh® to pay for it the first month (or purchase one already made from The Bunny Guy Store). Go to your local hardware store and find the honeycomb plastic grating that goes into suspended overhead lighting fixtures. Actually, any kind of metal or plastic grating will work, but metal grates will get eaten up by the caustic rabbit urine and plastic will not. The kind we buy is used in lighting fixtures and is easily cut to size with a diagonal wire cutter or wire snippers. Since it comes in 2X6 foot sizes, cut a couple extra grates and give them to your bunny friends. They will hug you for it when they see how much it saves them. If you prefer not to make your own or are not handy with tools, then you can purchase one of these grates that I have made by clicking this link to visit my store. 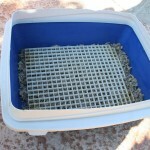 After we have lined the cleaned litter box with the usual absorbent material, the grating is placed on top. Then the box is filled to overflowing with the hay. Don’t skimp on the hay and you will find that y our rabbit will eat more hay. They like to forage and pick out the good parts, so the more hay you give them, the more good stuff they will find to eat. When your rabbit digs down into the hay in their box, they will not disturb the absorbent layer under the grate. This means that when you go to clean their box, you will find that they always pee into one corner. 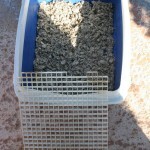 You will be able to scoop out the wet absorbent material, dump the rest that has not gotten wet with urine into another box or bucket and then clean the litter box with vinegar and water (this prevents the buildup up those white calcium deposits). You will discover that you will be saving 75 percent of the absorbent material each time you clean the box and another added benefit will be that your rabbit will not get those yellow stained feet from standing in his pee. This is just one of dozens of bunny secrets I share in my new book, The Bunny Lover’s Complete Guide To House Rabbits available from my store on this site. Everyone that I have shown this trick to has come back and thanked me for it. Hope you find it useful, too. I get people calling me all the time in a panic because their rabbit just left a big puddle of bright orange or red pee. They want to know what kind of awful disease that their bunny must have in order for him to eliminate in such vivid colors. My answer is always the same: red or orange pee does not really mean anything and that your rabbit can occassionally pee those colors. It does not mean that there is anything wrong. 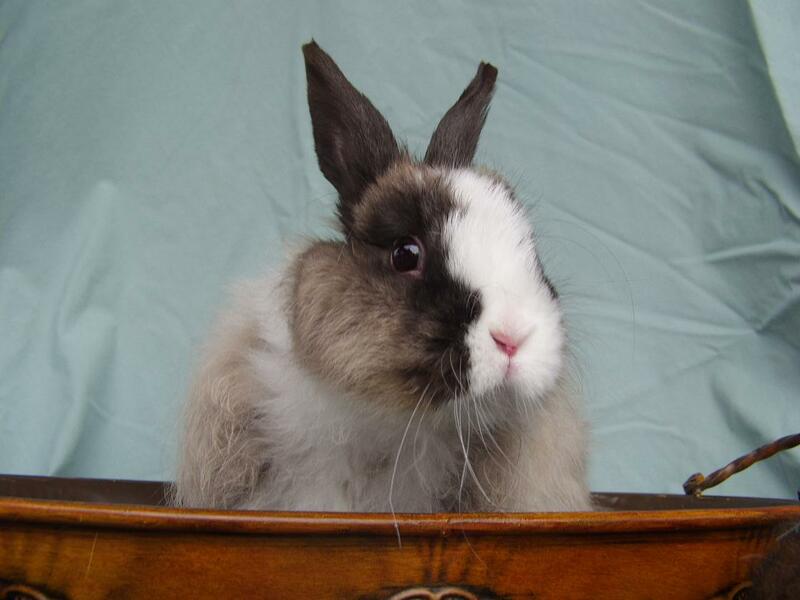 More importantly, you will want to watch your rabbit’s urine for signs of bladder sludge. 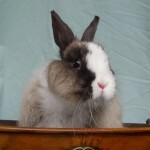 Rabbit’s urine is very high in calcium, which does not dissolve well in solution. It can precipitate out very easily and it is quite common for enough calcium precipitate to be left in their bladders, which causes a serious problem called bladder sludge. If your bunny’s urine appears gritty or thick in texture, this is a real concern. A rabbit’s bladder has the unique disadvantage of having it’s entrance and exit being near the top. This allows calcium to settle out and form a sludge that gets trapped at the bottom of their bladder. It can even form bladder stones, which an HRS friend’s rabbit is at the vet this very minute getting surgery to try and remove. They are painful and can cause other issues such as stasis or lack of appetite due to the stress and pain. If you see crystals or grit in your bunny’s pee, it means that he needs to see his vet before the condition becomes chronic. Bladder sludge and stones are a very difficult situation for which treatment is not always effective. Sometimes surgery is necessary to correct the condition and other times the vet can express or remove it through other therapies. The bottom line is do not wait until your rabbit is in agony to deal with the situation. Don’t worry about the technicolor urine if he makes it, but rather always be aware of the texture of his pee. That is the key to noticing the most common issue that rabbits experience with their bladders. Bladder sludge is a common and serious problem that is much easier to fix if caught early. Please don’t make the mistake of ignoring the early signs. A good bunny parent stays in tune with their bunny and notices little things like this. Rabbits are very good at hiding their illnesses and so you must be proactive when caring for them by checking their water and food intake daily. Observe their litter box to insure there are poops present every day and be on the lookout for any indication that sludge may be present. I know it has been a few weeks since I have updated this blog, but since my book was published a month ago, I have been consumed with promoting it and getting the sales going. I am happy to report that the sales have quadrupled from what they were last month and I really hope that trend continues. Today I sent copies of the book to several bunny-centric websites in hopes that they will like it and want to carry it to sell. I am working on getting everyone who buys a copy to review the book on Amazon, so that we can get higher rankings and therefore be seen by more people. Yesterday was a very nice Easter Sunday for us, because the Beach Bunnies had a meeting again at Buccaneer Beach. We were collecting chocolate rabbits to donate to a local women’s shelter and ended up dropping off 27 chocolate rabbits for the children of abused women, which is almost double what we gave them last year. We also had a busy Saturday educating the public at a Petco Unleashed, which I felt was very appropriate the day before Easter. My wife and I talked to dozens of people and it was good to visit with the two HRS fosters that we brought with us. Both of the foster rabbits were slated to be euthanized at a local shelter we work at for nipping, before the HRS pulled them from the shelter. I totally escapes me how the shelters can justify putting a bunny to sleep for nipping, when it is part of being a bunny to do so. Rabbits communicate by nipping and I personally feel that nipping is normal rabbit behavior. My lap bunny, Star nips me every day. It is her way of telling me something. Nipping by a bunny is a sign of good self esteem and confidence. A rabbit who does not have those good qualities usually will not nip, unless completely terrified or cornered. My bunnies nip me BECAUSE they are not afraid of me and are only trying to communicate something when they do it. YES, there are some highly socialize bunnies who have been taught not to nip, but this takes a lot of work and trust on the part of the rabbit. I believe that basically all rabbits were born to nip. There is a huge difference between biting and nipping. When a bunny nips, he is usually communicating something. In rabbit communication, a nip is like a human giving another the elbow. It means that you are clueless and missing something and to get with it. When a rabbit bites, you are going to lose a hunk of skin. A biting rabbit intends to hurt you and is seriously angry or trying to defend himself. Virtually all rabbits nip at one time or another and it’s intention is not to cause serious bodily harm. Trust me if a rabbit wanted to harm you by biting, you are going to be bleeding when he is done. A nip might occasionally break the skin, but in most cases will not. If it does, it is only because a bunny’s teeth are so sharp. For me, it is usually just a sharp pinch that hurts, but does not cause injury. Back to the subject of shelters euthanizing for nipping. I feel this is absurd. To me this is like putting a dog to sleep for barking. I realize after working for years with the shelters that they have a huge problem. More animals are usually coming in than are being adopted. Many critters spend months if not a full year waiting for a new home. The result of this is that any excuse to get rid of an animal becomes a serious and lethal one. It is a matter of space and economics, but the shelters are not the ones to blame. Ultimately, the guilt falls onto the public who create the situation of many thousands of homeless animals, rabbits included. Rabbits are a particularly difficult problem in many communities because people obtain them from pet stores or craigslist on an impulse. It pains me to see rabbits for sale in the malls, because I know that most of them will be bought by people on an impulse. They will be strolling along and see a cute rabbit in a mall store window. Even though fifteen minutes ago they had not idea that they wanted a pet rabbit, they were now the proud owner of a tiny baby one. Once they get their newly purchased pet rabbit home, the problems start because they are totally unprepared. Their homes are not bunny-proofed and they do not usually have proper cages or x-pens for them. One local pet shop was selling rabbits for $10 last week in the days before Easter. Most of these impulse bunnies are bought for around $20 and when the new owners find out that it will be around $300 to have her spayed, it just does not happen. It is then that things usually go from bad to worse. Carpets get chewed, as do the computer cords and TV cable. It is not long before the rabbit ends up locked in a backyard hutch or cage… or even worse let to run loose in the yard. Many people will bring home a male bunny, who soon as he reaches sexual maturity will start spraying to mark his territory. He will soon be banned from the house because the owners never get him neutered and so that behavior will not ever end. The public needs to become more informed about pet rabbits, so that they do not impulsively get them before preparing their home and family for what is involved in having one. It is too late when after you get a rabbit home to find out that one of your children or spouse is allergic to the fur or hay. I cannot tell you how many rabbits have been returned to the shelter for this reason. I can only imagine how many store bought bunnies are disposed off for this, since pet stores don’t take rabbits back if it doesn’t work out like the shelters do. Our local HRS gives classes to try and educate the public about how to care for, house and feed a pet bunny, but they are poorly attended considering the percentage of people who have rabbits and know virtually nothing about them. When I talk to people at educational events, I would venture to say that fully 80 percent of the folks who have a rabbit today, are not properly feeding, housing or caring for them. That is a very high percentage and just because you have had pet rabbits for 20 years does not mean that you know a lot about rabbits. These are the same people who tell me that their rabbits only live to be 5 or 6 years old and thoroughly believe that it is normal for them to live that long. Most are shocked when I tell them that they live to be at least twice that old. I will be the first to say that I had rabbits for 20 years myself and thought the same thing. It was a rude awakening when I finally realized that all of my previous rabbits had died an early death. We have a lot of work to do to change this vicious cycle of impulsive buying of rabbits and then ending up at the shelters. It will only happen through education. Every one of us that loves bunnies needs to make a small effort to educate those around us. Just like a YouTube video goes viral, we need to get this information about pet rabbits into the viral mode. It needs to be something that gets talked about over and over until a majority of the public understands that rabbits are not disposable pets. That rabbits are not a good kid’s pet. Even that rabbits are intelligent highly interactive pets, but that they are expensive and high maintenance. They are simply not for everyone. They are a ten year commitment that needs not be entered into lightly. If this can be done, then someday people will consider the consequences of getting a pet rabbit just like they would a cat or a dog. It is possible and while it may not happen in my lifetime, I believe that someday it WILL happen. The way it all starts is for you to tell someone you know all about rabbits. If enough people start saying the truth, it will become common knowledge. That is what I hope is in the future for all pet bunnies, don’t you?